Posts Tagged "town of whitehall"
Are you considering putting down roots and investing in a place of your own? Without question, buying a home is an exciting and life-changing moment – especially for first-timer buyers. It is also a complex process that can be wrought with confusion, anxiety and costly mistakes. How do you make a sound purchase and avoid common pitfalls? Whether you’re looking at homes for sale in Wilmington, DE or other metropolitan areas, you can set yourself up for success with a bit of insider knowledge. Here’s what expert real estate agents want everyone to know before they invest in their first home. Before you begin the search for your dream home, it’s important to take a long, hard look at your finances and establish exactly how much home you can afford. It may be tempting to stretch beyond your economic means for that perfect space in the perfect neighborhood, but this strategy is a slippery slope in the long-run. There are several home buying calculators online that can help you determine a price range that is safely within your budget. Now that you are clear on what your fiscal limits are, it’s time to check your credit score to ensure you are in tip-top shape for getting a mortgage pre-approval. If there are any errors on your credit record, take the time to get them sorted out to optimize your rating. Your credit score, along with your assets, income and outstanding debts will be analyzed when applying for a home mortgage. Once you have a pre-approval letter that stipulates the loan amount and terms, you’re in a much better position when it comes time to make an offer. The residential real estate market is literally brimming with choices. Think about what type of home and neighborhood fits your lifestyle, preferences and needs? Do you want a low-maintenance lifestyle associated with townhome living, or tons of yard space to create a garden? Take advantage of open houses, home showings and evaluate the pros and cons of each property you visit. Experts suggest researching local schools in the vicinity (even if you don’t have children), as this can impact home value. Once you narrow down your prospects, take a good look at the location and the neighborhood. According to a recent poll by the National Association of Realtors (NAR), nearly 80 percent of home buyers value neighborhood quality more than square footage of the home itself. Another 58 percent of homebuyers think a manageable commute is more important than having a large yard. According to NAR surveys, more than half of millennials prefer living in walkable communities with short commutes, while older generations tend to gravitate toward single family homes in suburban areas. 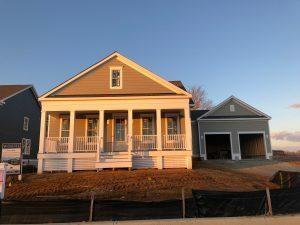 Montchanin Builders to proud to offer a wide selection of affordable, new construction homes in Delaware. If you want to live in a pedestrian-centric neighborhood close to excellent schools, public transportation and other amenities, we welcome you to tour our beautiful communities including Darley Green and The Town of Whitehall. Walkable communities in Delaware are in high demand for good reason. Discover the myriad benefits by scheduling a Montchanin Builders home tour today and ask about our special financing options for first-time buyers. Walking is an excellent form of exercise, one that can help you reach your fitness goals. This low-impact movement is the preferred cardiovascular activity for people with ankle, knee and back problems, and can be done for longer periods of time without placing added stress on the body. Taking a brisk daily stroll is one of the easiest things you can do for your mental and physical health, say medical experts, who cite amazing health benefits such as lowering risk of chronic diseases. In fact, one purposeful 30-minute walk a day is sufficient to reduce the risk of early death by up to 15%, according to scientific studies. 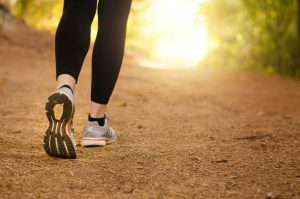 If this isn’t motivation enough to get up and get moving, consider these 5 health benefits of walking every day. Incorporating a brisk jaunt into your daily routine helps to regulate blood pressure and can treat hypertension. According to joint study at the University of Boulder Colorado and the University of Tennessee, blood pressure in patients was lowered by up to 11 points with regular walking, thereby lowering risk of stroke as much as 40%. Research by the American Cancer Society demonstrated that women who walked an hour each day ( at least 7 hours per week) had a 14% lower risk of developing breast cancer compared to those who walked less than 3 hours a week. Protect yourself during flu season with a daily walk, which helps boost the immune system keeping sickness at bay. In one study involving 1,000 participants, those who walked at least 20 minutes a day, five times a week had almost 45% fewer sick days than those who did not. Trying to reach a weight-loss goal but don’t have time to hit the gym? Regular walking – such as to and from work or your neighborhood park can boost the body’s metabolism and insulin response, which will help you burn fat and lose weight. It’s no secret that physical activity gets the creative juices flowing, and walking is no exception. Taking in fresh air with a quick walk provides an opportunity to clear the mind of common stressors. Research on how exercise relieves anxiety has shown that a 10-minute walk can be just as effective at lifting your mood as a 45-minute workout. There’s no need to haul yourself to the gym when you live in a pedestrian-friendly area — a neighborhood that is conducive to and encourages walking. Prior research has shown that walkable mixed-use cities and neighborhoods are strongly tied to reduced rates of chronic disease and obesity. Imagine living in a community where you’re not car dependent and can walk to your local café, grocery store and favorite restaurant when the urge strikes. 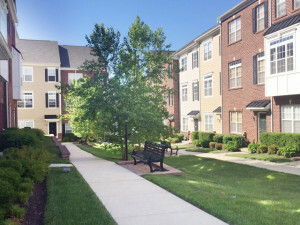 Walkable communities of Delaware townhomes like Darley Green and The Town of Whitehall encourage residents to get outside, spend more time together and develop social bonds. Living in a walkable community fosters interaction across multiple generations, while strengthening a sense of community pride. Residents in master-planned neighborhoods created by Montchanin Builders, innovative home builders in Delaware, have a greater sense of camaraderie while enjoying the numerous health benefits of being able to walk to and from retail establishments, their local playground and other points of interest. Wondering where to live in Delaware? Ample studies have established the positive impacts that walkable neighborhoods have on everything from physical and mental health to lower crime rates and housing values. Boasting lush green spaces and beautiful ranch homes close to shopping, dining and entertainment, Darley Green and The Town of Whitehall offer some of the best townhomes for sale in Delaware with walkable communities. Call Montchanin Builders at 302.472.7212 to arrange a private home tour today! 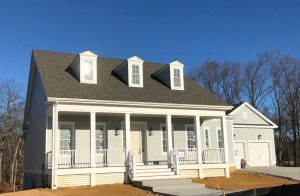 Montchanin Builders in The Town of Whitehall is pleased to announce the availability of a new move-in ready home in this growing neighborhood in Delaware located at 550 Wheelmen Street. It’s a newly built bungalow that offers all the beauty of modern design with the convenience of single story living. This home is ready for you to call it home, so schedule your personal tour today! This 2,142 square foot bungalow has curb appeal in spades. Stroll up to the covered porch to enter via the front door, or park in the spacious, two-car garage. When you enter the foyer, take a minute to relax in the adjoining sitting room, or enter via the garage and drop off your shoes and handbag in the roomy storage area. As you enter the main living area, take in the wide open space. The gourmet kitchen is nestled alongside the dining area, which overlooks the comfortable living room and its charming fireplace. Not in the mood for formal dining? There’s plenty of outdoor living space on the included deck just off the kitchen. When it’s time to turn in for the evening, the two guest bedrooms are located just off the living area. A full bath is conveniently situated between them. The master bedroom is on the other end of the home near the deck. There’s plenty of space for a king size bed, dressers and more! It also features a large walk in closet and master bath with double bowl vanity, a soaking tub to relax and unwind in, and a separate commode. 550 Wheelmen Street is a sunny, spacious bungalow with beautiful views. When it’s time to enjoy the great outdoors, you can relax on the deck overlooking the pond. Or, take a stroll around your new neighborhood. Stop by the community playground, or head over to the common area for a neighborhood BBQ. You’ll find that the masterful architecture is only part of the reason why this area is so popular among Delaware residents. The Town of Whitehall is known for friendly faces and fun community activities. Will this beautiful bungalow be yours? Properties in Delaware by Montchanin Builders sell quickly, so if you’ve got your heart set on this charming home, you’ll need to act fast. We’ve partnered with Supreme Lending to offer our clients personalized financing options. Supreme Lending is a mortgage originator, which means they can offer some of the lowest rates and closing costs in the industry. Call us today at 302.472.7212 to claim 550 Wheelmen Street before someone else does! Ranch-Style Homes vs. Two Story: Which Is Best? Home buyers have a lot of tough decisions to make. Which school district is best? Which planned community has the right amenities? And would a ranch or two-story home be better? Of course, there are plenty of advantages to both ranch-style and two-story homes in Delaware. Perhaps the easiest way to determine which is best for your family is to consider your current living arrangements. If you have a starter home that’s a ranch, perhaps you’re already longing for a second story. If you have a two-story home, maybe you’re looking to downsize? Consider the following factors when making your choice. Ranch-style homes are uniquely charming, and they offer more space than you might think—especially if you choose an open floorplan. Many people find one-story homes to be highly convenient. For instance, there’s no need to move laundry baskets and vacuum cleaners between floors. Perhaps the most compelling reason to purchase a ranch-style home is if you have young children. A home without stairs is one less safety issue to worry about when a toddler is underfoot. Safety is also a concern for home buyers who are approaching their golden years. If you intend on aging in place, a one-story home is a safer choice, and there will be no stairs to trouble arthritic joints. You might also want to choose a ranch home if there’s a possibility that an aging parent will move in with your family at some point. Families with younger kids and/or teens often prefer two-story homes because they offer some separation between living areas. Teens who like to stay up later can watch TV downstairs while their parents get some much-needed rest upstairs in the master suite. Another major benefit of a two-story house doesn’t actually pertain to the house itself. Since half of the square footage is located on top of the other half, a large two-story home won’t take up a lot of space on the lot. This means you’ll have a more generous yard, which is particularly appealing for gardening enthusiasts and families with dogs. Speaking of yards and landscaping, you’ll have spectacular views from a second-floor window. Montchanin Builders offers home buyers the best of both worlds. You can move into two-story or ranch-style homes in our Delaware community of The Town of Whitehall. 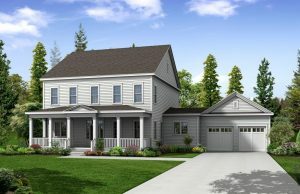 The Salisbury model is a stately two-story home. It features an award-winning floorplan, with more than 3,800 square feet, four bedrooms, and three and a half baths—plus a second floor activity room! Or, choose The Chesapeake floorplan also found in The Town of Whitehall! The Chesapeake offers single-story living at its very best. Enjoy more than 2,000 square feet featuring an open floorplan, with three bedrooms and two baths. Lots of other choices are available for discerning home buyers in Delaware. Call Montchanin Builders today, and be sure to check out our other master-planned communities! Today’s home buyers want more than the American dream of a tidy house with a white picket fence. To accommodate their busy lifestyles—and help them get the most out of their rest and relaxation time—modern home buyers demand convenience, amenities, uniform infrastructure, and wide open spaces. It seems impossible to accommodate all of these must-haves in one location, but that’s exactly what builders of master planned communities in Delaware have accomplished. People who purchase homes in planned communities tend to share the same basic values in life, including the firm commitment to true neighborliness. The days of borrowing a cup of sugar from a neighbor might be long past, but master planned communities are still close-knit places where neighbors look after each other. A planned community is like its own little town. Residents have the tranquil experience of neighborhood living, but with easy access to major attractions nearby. Planned communities are typically located within minutes of commuter trains and major roadways, allowing residents to easily commute to work. Families can also take advantage of the attractions in the nearby major cities, like concerts, theaters, and museums. Today’s planned neighborhoods are true communities in every sense of the word, with neighborhood shops and other amenities within walking distance. Modern home buyers love the peace and relaxation of being away from the city, but they still want the amenities that city life brings. Planned communities are the perfect marriage of these two ideals. Within their own neighborhoods, families can walk their kids to the primary care physician, enjoy a cup of coffee at the corner deli, and head out for an evening stroll along the nature trails. All of these perks—and more—can be found in the most highly coveted planned neighborhoods. Another compelling reason behind the planned community trend is the effect it has on home values. No matter how carefully a homeowner maintains the property, that house’s value is affected by the neighbors’ homes. If a neighbor decides to subdivide a lot and put a mobile home on it, the value of the nearby houses will decline. This is a common problem that planned communities eliminate. Since the lots are developed according to a master plan, and the use of the lots is regulated, homeowners never have to worry about the value of their property decreasing because of a neighbor’s choices. Montchanin Builders is proud to have been the innovator behind some of the most highly coveted addresses in the Wilmington, Delaware area. Our masterfully planned communities include Darley Green, The Town of Whitehall, and The Overlook at Rockford Falls. Aside from our beautiful, move-in ready homes, home buyers choose Montchanin Builders because of the incredible amenities of our communities. From nature trails and water features to shopping and entertainment, our neighborhoods are walkable masterpieces. Homes in our communities in Delaware sell fast, so call us today at (302) 472-7212. Which of These Beautiful New Houses Will Be Your Family’s Next Home? Shopping for a new home is a thrilling experience like no other — but also one full of challenges. You’ll compare features, architectural styles, locations, and school districts. You’ll also attend countless open houses and drive through more neighborhoods than you can shake a stick at. But at the end of the day, we’re confident you’ll choose a Montchanin Builders property in The Town of Whitehall in Middletown, Delaware. It’s so much more than a neighborhood or development. It’s a masterfully planned community, and it’s a feast for the eyes—with tree-lined streets, parks, nature trails, coffee shops, and playgrounds. We have a few under construction and move-in ready homes available, but we expect them to be sold quickly. Stop by soon to find out if one of the following houses will be your family’s next home. This address is home to a our award-winning Salisbury floorplan. As you walk to the spacious front porch, imagine enjoying a cup of coffee on a hammock, waving to your friendly neighbors. Or, invite friends over for a barbecue on the rear deck. This particular home site offers an extended rear deck, and it’s on a beautifully wooded lot! Inside, you’ll find a chef’s dream kitchen with genuine maple cabinets, gorgeous granite countertops, and top-of-the-line Whirlpool appliances. The main floor embodies a modern rustic feel, with its wide plank hardwood flooring, oak staircase, and gas fireplace in the great room. 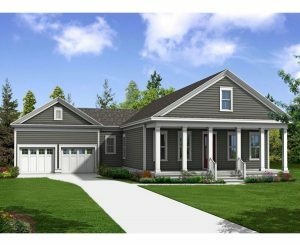 The Salisbury model offers plenty of room for your family—more than 3,800 square feet on two levels! You’ll have four bedrooms, three and a half baths, and an oversized two-car garage. 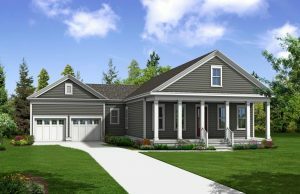 At 550 Wheelmen Street, you’ll meet our much-coveted Chesapeake model. It’s the utmost in single-story living for perfect for those downsizing or looking for everything on the main level. The Chesapeake is a charmer, and it makes the most of its 2,142 square feet. This bungalow features three bedrooms, two baths, and a large, two-car garage. Like all of our move-in ready homes, the Chesapeake model features a gourmet kitchen that would be the envy of any pro chef. It features spacious, Shaker style cabinets and granite countertops. This cozy home offers an open floor plan with flex space. You can turn the sitting nook into your own personal library or home office, but in warm weather, you’ll probably prefer to be out on the rear deck overlooking the pond. For more information about our new homes and planned communities, check out our website or call us at 302.376.1100. Montchanin Builders partners with one of the most respected mortgage lenders in the U.S. Our relationship with Supreme Lending gives soon-to-be homeowners access to custom financing, with a quick turnaround time and the best customer service in the business! Join The Town of Whitehall for Our Charitable Food Truck Fest! The Town of Whitehall is excited to team up with The Ministry of Caring Millennials to host a fundraiser to benefit needy families throughout our Wilmington, Delaware community. Join us on Saturday, August 26th from 12 pm through 4 pm in The Town of Whitehall on Mapleton Avenue in Middletown, Delaware. Admission is free, and the fundraiser welcomes attendees of all ages. Feast on the best that local food trucks have to offer, and enjoy music and the company of your neighbors while raising money for a worthy cause. On Saturday, some of Wilmington’s most mouthwatering food trucks will be calling The Town of Whitehall home. I Don’t Give a Fork, Maiale, Uncle John’s Barbecue, and Outlandish Food Truck will be serving up delectable dishes in the name of charity. I Don’t Give a Fork has earned local acclaim for its inventive sandwich creations. With specialty sandwiches like the mac & cheesesteak, sloppy pig, buffalo bleu hen, and burger hoagies—these aren’t your mother’s sandwiches. Maiale Deli and Salumeria is known as the Sausage King of Delaware. Their food truck, The Rolling Pig, serves up sausage sandwiches, salads, and other local favorites like short ribs, Larry’s Chili, and corned beef Reuben. Uncle John’s Barbecue specializes in smoked BBQ, but also serves sandwiches and sides. Outlandish Food Truck is known for its chicken and waffles, truffle tots, crab fries, and its signature sandwich—The Outlandwich, composed of rum-soaked berries and brie grilled cheese with fries. The Passionista Fashion Truck will also be making the rounds at The Town of Whitehall. Your entire family will love the live entertainment at our fundraiser. Catch a preview of some of the talented performers on the event’s Facebook page. You can hear a clip of Andrew performing with his violin. Andrew is a student at the Cab Calloway School of the Arts, who has generously agreed to donate his time and talents. We’re also excited to welcome the Uncle SAMS string band to the stage. Savannah Klumpp (banjo, guitar, and vocals), Andrew Vogts (fiddle, whistling, and vocals), Max Huhn (mandolin, fiddle, guitar, and vocals), and Sebastian Roat (guitar and vocals) are the four members of Uncle SAMS (SAMS is their initials put together). The talented young musicians formed their group when they met at a bluegrass get-together hosted by a teacher at their school, the Cab Calloway School of the Arts. The Town of Whitehall’s fundraiser benefits the Ministry of Caring Millennials—a dynamic group of people who are committed to giving back to those in need. The group’s ultimate goal is to “go out of business” by eliminating poverty in Wilmington. To accomplish its goal, the Ministry offers helping hands and resources to meet a diversity of needs—from nutritious meals at Emmanuel Dining Room to transitional, long-term, and temporary housing. The Ministry assists the impoverished and homeless with childcare, education, and unemployment assistance, just to name a few. The Town of Whitehall and Montchanin Builders are pleased to have the opportunity to support this incredible group of selfless volunteers, donors, and staff. While you’re here, tour our move-in ready homes! 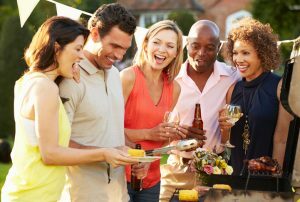 We hope you enjoy the festivities on Saturday, August 26th at the Town of Whitehall, our move-in ready homes boast luxurious features, including spacious front porches, upstairs activity rooms, and first-floor owner’s suites. Be sure to check out our other award-winning communities, including Darley Green and The Overlook at Rockford Falls. Montchanin Builders is committed to enriching the lives of Delaware residents by creating beautiful places to live, work and play. Boasting more than six decades of combined experience, we are proud to lend our names to Delaware’s most innovative residential communities that feature the best in craftsmanship, design and lifestyle amenities. From the master-planned development of Darley Green to the more recent Town of Whitehall, our team is dedicated to creating homes and neighborhoods where life’s most cherished memories are made. We take great pride in building amazing, affordable family home communities that feature space-creative interiors, inviting floorplans and the flexibility to customize according to taste. And every now and again, our hard work and quality workmanship is recognized by more than just our homeowners. 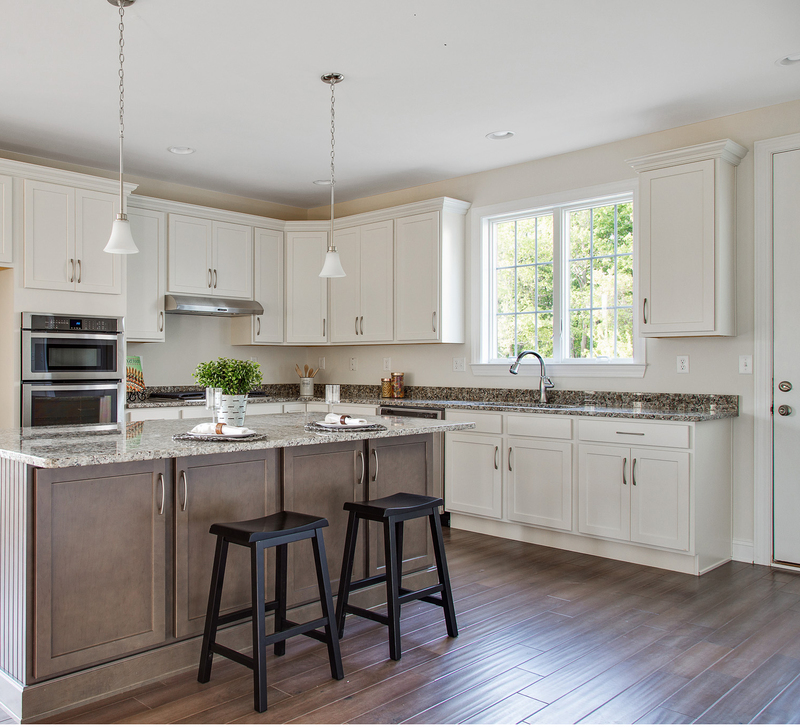 This year, Montchanin Builders received two Regal Awards presented by the Home Builders Association of Delaware — a member of the National Association of Home Builders (NAHB). In addition, Montchanin was also the recipient of the Maryland Building Industry Association (MBIA) Maryland Award of Excellence for Outstanding Merchandising and a recipient of the Great American Living Awards (GALA) Award of Merit in Interior Design and Merchandising. The Town of Whitehall, one of Montchanin Builders newest communities, has already garnered lots of positive press for its wonderful “hometown” ambience, lavish estate homes and walkability. 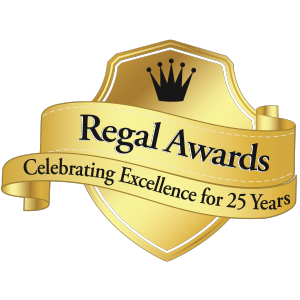 Montchanin’s 3,800-plus square foot Salisbury (our flagship model) won the Regal Award in Celebration of Excellence for Best Luxury Community Home. The Salisbury features spacious interiors that were made for raising a family and entertaining with style. This exquisite 4-bedroom, 3 ½ bath home has a gourmet kitchen, two-car garage and a sweeping master bedroom suite with walk-in closet. Like other homes in this forward-thinking development, the Salisbury is in walking distance to shopping, restaurants, parks and other points of interest. In regard to their efforts on the Salisbury model, Montchanin also received the Maryland Building Industry Association (MBIA) Maryland Award of Excellence for Outstanding Merchandising. The Carlyle – a three-story townhome in Darley Green— was presented with the Home Builders Association of Delaware 2017 Regal Award for Best Multi-Family Home. This stylish residence has three bedrooms, 2 ½ baths and up to 2,100 square feet of finished living space. The family-centric model features an open floor plan with space expanding features like a recreation room and an optional loft. Darley Green is Montchanin’s prized master-planned community, ideally situated just 10 minutes from downtown Wilmington in the highly desirable Brandywine School District. Darley Green’s new construction homes are within close proximity to varied dining and recreation options, and feature retail establishments, trails and a state-of-the-art library on site. 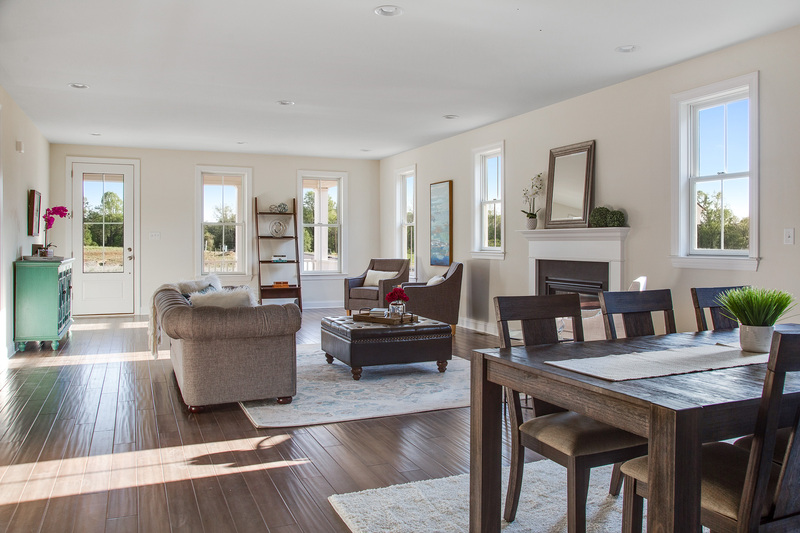 If you’d like a firsthand look at Montchanin’s Regal Award winners or want to learn more about our exciting Delaware communities, we invite you to contact our sales team today and arrange a private home tour! Has there ever been a more comforting thought than home? A warm, inviting place where families raise their children and lasting memories are created. When The Town of Whitehall was envisioned, the developers wanted more than just beautiful homes with sweeping front porches – they wanted a truly walkable development where neighbors gather in communal spaces, friends meet up at the corner café, and children ride their bikes and play in the great outdoors. Situated just north of Middletown, DE, The Town of Whitehall truly embraces the idea of a great hometown: a place where community is important and people are encouraged to connect whether they are walking to work, taking an afternoon stroll, or gathering for an evening get together at Mapleton Square. 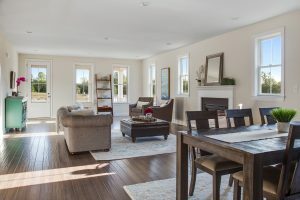 This one-of-a-kind development – which boasts an enviable address along the picturesque bank of the Chesapeake and Delaware Canal — is the first walkable town founded in Delaware in more than 100 years, and lots of people are taking notice. The Town of Whitehall not only celebrates the charms of small-town living with broad, tree-lined streets, it offers numerous community amenities that promote social interactions with neighbors. Interwoven with civic spaces, retail stores,and miles of picturesque trails, The Town of Whitehall is a new American hometown that captures the warmth and vitality of years past. Montchanin Builders is proud to invest our talented craftsmanship into this acclaimed community, with a series of luxurious estate homes featuring open floor plans, gourmet kitchens, 3-4 bedrooms and grand front porches that are perfect for gatherings with family, friends and neighbors. 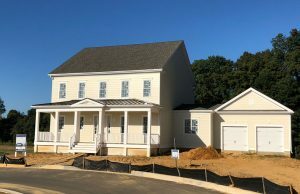 If you’d like to schedule a tour, or would like more information about this new home community in Delaware, we invite you to call our sales office at 302-376-1100.